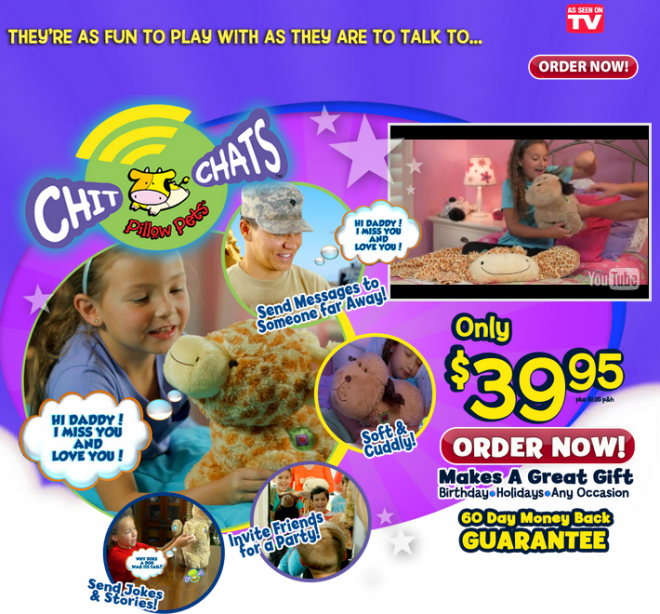 Chit Chats are stuffed animals that can record, send, and receive messages. Chit Chats are a safe and creative way for children to talk to each other in the form of stuffed animals. The product website is chitchats.com, which was registered in February 2005. The screen capture below shows the official website in October 2015. Chit Chats are in the growing category of texting toys. We’ve seen such products as CloudPets and Text Me Teddy Bear which also offer communication via a stuffed animal. Now with Chit Chats, we have 4 varieties of stuffed animals which allow kids to talk to each other. Although older kids are accustomed to talking via smartphones and tablets, younger kids may find the simplicity of a product like Chit Chats to be easier and more fun. Perhaps the only caveat is that it requires at least one other friend to own a Chit Chats pet in order to really make it worthwhile. Another benefit is that parents can keep a tighter control over who the kids communicate with when using this toy. Giving this as a gift when your child already has one may be a good way to be sure your kid has someone else to talk to. Overall, Chit Chats is a lot of fun for smaller kids, provided they have a friend to communicate with. Older kids will probably want a more “adult” type of communication device. Let us know what you think of Chit Chats by leaving a comment below and a star rating above. James White is a participant in the Amazon Services LLC Associates Program, an affiliate advertising program designed to provide a means for sites to earn advertising fees by advertising and linking to Amazon.com. © 2019 Freakin' Reviews. All rights reserved.